Great piece, Godfather! Will fwd this to some non race fan friends, who will be enlightened. I really like your thought process here! Here's to it! I am just saying! What a classy young man. Quite a contrast to some full time drivers who exhibit all the traits of a 2 year old brat. One H of an outstanding young man! And, oh by the way one H of a outstanding talent also! Too bad Jack can't appreciate what he had in the #6! 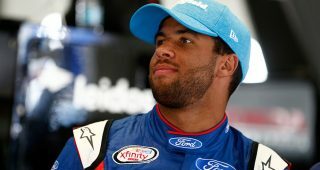 Darrell Wallace already showed there is legitimate racing talent there having won five times in the Trucks and posted seven top-tens in his truncated Xfinity season in Roush's #6, so when it came out that he would drive Petty's #43 (presumably at Roush's behest given Petty's alliance with Jack) it wasn't an untoward choice; the only nit to pick was that Regan Smith, who'd showed promise in Petty's #43 in the two races (plus the All-Star open) he ran, had to be let go. 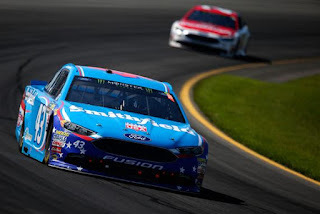 Watching the #43 at Pocono the back-to-back pit penalties for Wallace killed his day not thirty laps in; from there the only thing left to do was pass whoever he could; he passed some cars and actually made up a lap on Brad Keselowski when Kes was leading. If Wallace keeps going there's clearly speed in the #43 for him. Even as I wish Bubba all the luck in the world what I'd really like to see is the media folks not concentrating on his being a black driver but simply to see him as a driver, a racer. The young man is good, lets just see him as a talented racer. Lets not hype his being black as has been Danica's being female. Far too much has been made of Danica without any real reason, lets not do that to Bubba.He's simply another talented RACER! The biggest difference between Bubba and Danica isn't race or gender it is how they got to where they are. Bubba came up though the lower divisions where he has won numerous times and knows what winning is all about. It would be a true shame if Bubba doesn't get into a truly competitive Cup team so he can continue his winning ways i.e., when he was in top KBM equipment in the Truck series. Given better Xfinity equipment, he would have won there also! 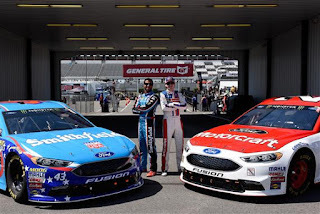 Bubba got more out of his Xfinity cars than was built into them based off of driver skills and driver skills alone! 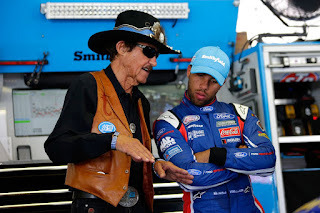 Dave, I have one question for you, did Jack the Hat tear up the contract he had between Bubba and RFR? I mean legally how else could he "shut down the #6 team" and oh by the way when the driver and team were sitting in 4th place in both the driver's and owner's championship races only to repaint Bubba's car to display the #60 but same RFR Mustangs and further more use the #6 Crew Chief Seth Barbour and the rest of the #6 crew to put another driver Ty Majeski in Bubba's seat while still having Bubba under contract? If so, I would think Bubba would have some legal recourse against Jack the Hat Roush and all of RFR? At a minimum, Bubba should be a total free agent and able to get in any car he finds available this week vice sitting and watching his old #6 go around Iowa Speedway. Now, I know Ford would have a say in which car he gets in but, basically Bubba's contract with RFR should be NULL and VOID !